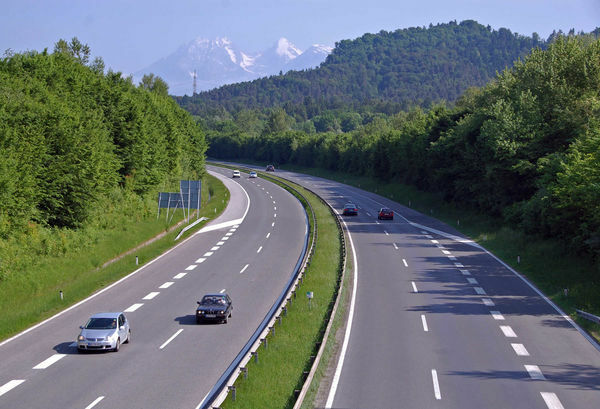 European superhighways, like this one in Slovenia, can take the stress out of driving in a foreign country. You'll encounter tollbooths on major expressways in Mediterranean countries, such as on Italy's autostradas. For a handy A-to-Z index of European-country driving tips, see the British Automobile Association's website. When you pass other drivers, be bold but careful. On winding, narrow roads, the slower car ahead of you may use turn-signal sign language to indicate when it's OK to pass. This is used inconsistently — and don't rely on it blindly. Be sure you understand the lane markings — in France a single, solid, white line in the middle of the road means no passing in either direction; in Germany it's a double white line. After a few minutes on the autobahn, you'll learn that you don't linger in the passing lane. For passing, use the left-hand lane on the Continent and the right-hand lane when driving in Britain and Ireland. In some countries (such as France, Germany, and the Netherlands), it's illegal to use the slower lane for passing. In Greece, slower drivers don't pull over, but drift as far right as possible to let cars pass. In roundabouts, traffic continually flows in a circle around a center island. While you'll see them sporadically throughout continental Europe (where vehicles move counterclockwise), roundabouts are everywhere in the British Isles (where traffic flows clockwise). These work wonderfully if you follow the golden rule: Traffic in a roundabout always has the right-of-way, while entering vehicles yield. For many, roundabouts are high-pressure circles that require a snap decision about something you don't completely understand: your exit. To replace the stress with giggles, make it standard operating procedure to take a 360-degree case-out-your-options exploratory circuit. Discuss the exits with your navigator, go around again if necessary, then confidently wing off to the exit of your choice. (Don't worry. No other cars will know you've been in there enough times to get dizzy.) When approaching an especially complex roundabout, you'll first pass a diagram showing the layout and the various exits. And in many cases, the pavement is painted with the name of the road or town to which the lane leads. Across Europe, it's illegal to turn right on a red light, unless a sign or signal specifically authorizes it (most common in Germany). In many countries, traffic is monitored by automatic cameras that check car speed, click photos, and send speeders tickets by mail. It's smart to know — and follow — the area speed limit. Most countries require safety seats for children under age three, and a few — including Ireland and Germany — require booster seats for older kids. In nearly all countries, children under 12 aren't allowed to ride in the front seat without a booster seat; a few ban kids from the front seat no matter what, and some have front-seat rules for kids up to age 18. The legal blood-alcohol limit is lower across the Continent and in Ireland than in the US, and punishment ranges from steep fines to imprisonment. In France, all cars need to have an unused Breathalyzer on board (supplied if your rental starts in France, but ask about this if you're picking up the car elsewhere). Europe takes its DUI laws seriously, and so should you. Nearly all countries forbid using a hand-held mobile phone while driving. Many European countries require you to have your headlights on anytime the car is running, even in broad daylight. And many require each car to carry a reflective safety vest or kit with a reflecting triangle (typically supplied by the rental company). Your car-rental company should be aware of these rules — just ask. Or you can research them on the US State Department's travel website (search for your country in the "Learn about your destination" box, then click "Travel and Transportation"). Online mapping apps are a huge help for drivers looking to avoid backups, and at least occasional data use can be worth it for traffic updates. But even with up-to-the-minute road info, alternate routes aren't always an option — especially on rural routes, where construction work can leave you sitting still for long stretches. In summer — prime time for roadwork in Europe — I budget in at least an extra half hour for construction delays for any long-distance drive. Note that Europeans have the same rush hours we do, especially in the north. Mediterranean resort areas are extremely congested on summer weekends. The shortest distance between any two European points is the Autobahn/strada/route/cesta. Some prefer the more scenic national highway systems. These small roads can be a breeze, or they can be dreadfully jammed up. It's free to drive on expressways in some countries, such as nearly all highways in Great Britain and Germany's famous autobahn. 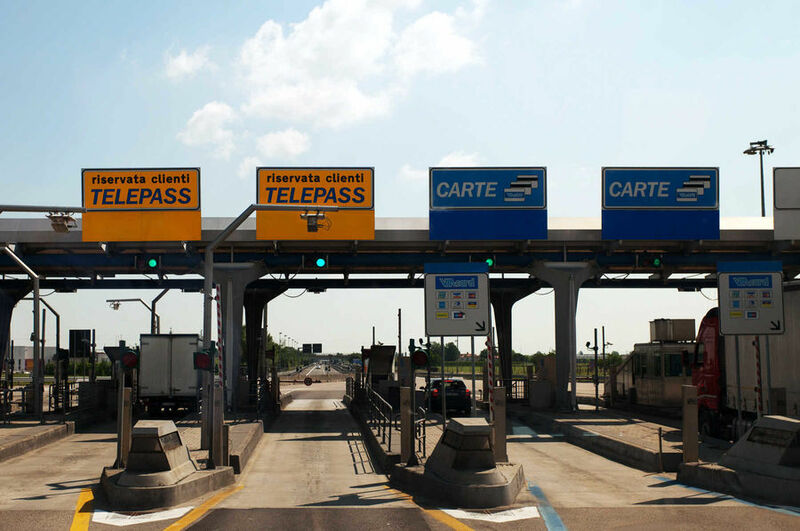 But on major expressways in much of Mediterranean Europe — including Italy, France, Spain, Portugal, Greece, and Croatia — you'll encounter toll booths; fees are based on the distance you drive (about 12 cents/mile). Some countries are introducing automatic, cashless toll systems (such as Portugal) — but there is typically a toll-booth option to pay with cash or a card. Other countries require drivers who are using expressways to buy a permit sticker (called a "vignette") to display in their windshields (Austria, Bulgaria, Czech Republic, Hungary, Romania, Slovakia, Switzerland, and Slovenia). You'll pay about $40 for the decal in Switzerland (good for a year); everyplace else offers a short-term permit (7–10 days) for $10–20. Your rental car may already have an unexpired sticker; if not, you can usually buy one at border crossings, gas stations, and post offices. If you don't have a sticker, you'll soon meet your first local…in uniform. Fines start at around $150. Although tolls can add up (for example, it's about $70 to get from Paris to the French Riviera, and about $20 from Rome to Naples), the fuel and time saved on European expressways justifies the expense. Note that in any country, if you're skipping the expressways and sticking to secondary roads, you don't need to buy a toll sticker or otherwise pay for road use. If visiting big cities, it's best to park your car on the outskirts and use public transportation or taxis. Cities across Europe have taken measures to discourage urban driving. For example, to drive anywhere in downtown London or Stockholm, you'll pay a "congestion charge." You'll pay a toll to drive into Oslo and Bergen — but because of their automated systems, you may not know it until you get a bill two months later. And keep in mind that in many cities, cars must meet a certain emission standard to enter the city limits (unlikely to be a problem with your rental car). Car traffic is banned altogether in many Italian city centers, including Rome, Naples, Florence, Pisa, Lucca, Siena, San Gimignano, Orvieto, and Verona. Don't drive or park anywhere you see signs reading Zona Traffico Limitato (ZTL; often shown above a red circle). If you do, even briefly by accident, your license plate will be photographed, usually without your knowledge, and a hefty ticket — or tickets, if you did it multiple times — will be waiting for you at home. Driving in Europe tends to be more aggressive than in the US, and some Europeans, particularly Italians and Greeks, seem to make up their own rules of the road. In Rome, for instance, red lights are considered discretionary. On one trip, my cabbie went through three red lights. White-knuckled, I asked, "Scusi, do you see red lights?" He said, "When I come to light, I look. If no cars come, red light stupido, I go through. If policeman sees no cars — no problema. He agree — red light stupido." Once you're behind the wheel, you may curse the traffic jams, narrow roads, and macho habits, but it's all part of the experience. Driving at home is mundane; driving in Europe is memorable.